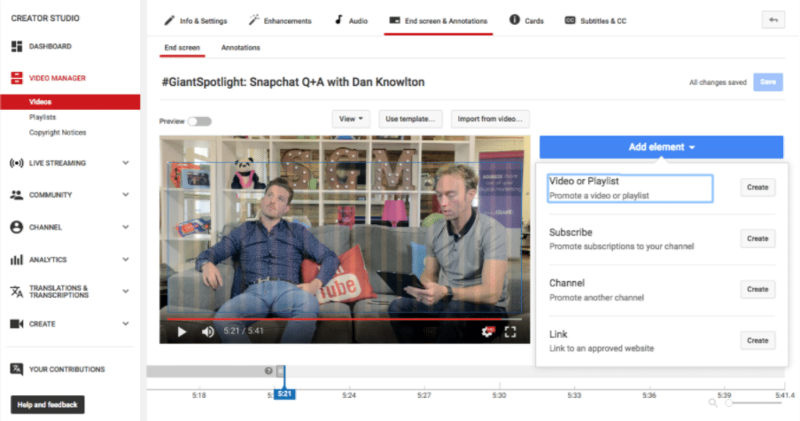 Are Your YouTube Videos Mobile Optimised? As you all know mobile is getting bigger and bigger, in fact, mobile is pretty much a priority now. Google released earlier on in the year that mobile has officially surpassed desktop traffic, if that doesn’t express its importance nothing will! Every digital marketing influencer has been talking about mobile for the past three years along with video. Video is also growing at a massive rate! Video will take up 80% of internet traffic by 2019 and it’s a must for businesses everywhere. Earlier in the year YouTube released a mobile app that aided the production of company videos lending templates and tips to guide business owners into making cheap yet good quality videos. This app really showed us that YouTube cared about furthering their reach to mobile but there was still no change for annotations that worked on mobile! If you’ve used the YouTube app on your phone you’ll know that annotations (the little boxes drawn over videos to make them click through to other content) don’t actually work on mobile and it’s really frustrating! But, worry no longer! YouTube have recently updated the way annotations work so now there is a mobile option, kind of, Youtube have pretty much got rid of annotations and instead offer end cards. YouTube gives you the warning Annotations don’t work on mobile. Try Cards or the new End screen tool instead. To encourage users to edge away from annotations. We’re actually really surprised how easy it is, you simply click add element and then chose from the options, easy. The only thing you still need to bare in mind when editing your video is an end image, place an image at the end of your time line in your video editor for the last 5-20 seconds of your video and this will give you a good background to add your end card over. As you can see the elements are limited, you can only add in a video or playlist, subscribe button, links to approved website and other channel promotions, although this seems restrictive it’s actually everything you could need. You can make end cards by adding elements like in the images above or you can choose a YouTube template to follow alternatively you can copy the end screen from another video you’ve done. There is only one catch, you can’t use annotations and end cards together, if you try to do so you’ll be prompted to un-publish any outstanding annotations to benefit the user experience. You can check the metrics in YouTube analytics. I’m sure we will see some spammy overloads over YouTube in no time at all, but for now we really appreciate this new update! Keep an eye out for our GIANTThursday video coming soon giving you a better insight into how you can use end cards.